This months entry is a double banger, two for one! A cook pot and stove combination! I call the cook pot the GI R2 Kettle. It serves as a canteen/cookpot(we love multifunctional). 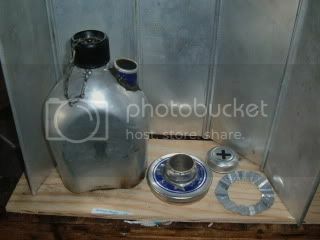 It originally held 4 cups of fluid but after running a Bud Lite aluminum bottle(chimney) through it, it now holds 2.75 cups of fluid. It still fits in its military canteen cover. Why pay $75 for a Kelly Kettle when you can make one right out of GI surplus. 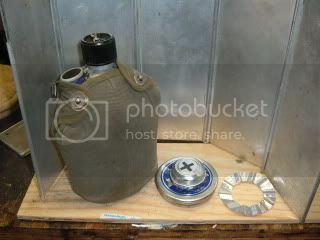 I found this canteen at the thrift store and it has been in a pile of gear for several years. I never used it and have passed on several more at the thrift store but not anymore. I basically drilled a hole in the top and used the dremel cut-off wheel to cut the larger hole in the bottom. The bottle stands at a slight angle. My thinking was twofold. 1 ) More heat pushing against the side and 2 ) Did not have to mess with the threaded neck and cap. I then put a heavy layer of J-B Weld around the bottom and top entrance and exit wounds(just got back from hunting trip). 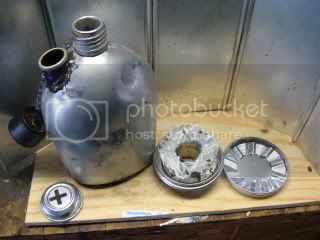 Then I used the dremel cut-off tool to cut the bottom of the bottle(chimney) so it was parallel to the bottom of the GI R2 Kettle(Canteen) and stuck out beyond the bottom about 3/16" to allow for a good bead of JB-weld. Now I needed a stove to use with the GI R2 Kettle. I have been wanting to make a stove out of the York Peppermint tins for quite some time. My thinking was it has a low profile and would give good support and stability for the kettle. I am calling this stove the "Sargent York Stove". 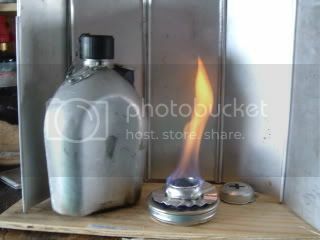 It is similar to a trangia stove. I cut the top of a Jolt can off and flattened the slight angle of the top that runs around the bottom of the neck. 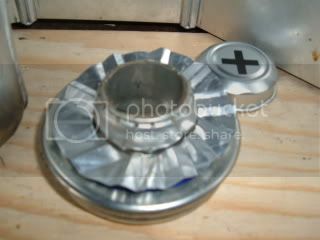 I then cut a hole in the lid of the York tin just large enough for the Jolt neck to fit through and JB welded it into place. I drilled 16 jet holes in the top of the Jolt neck. 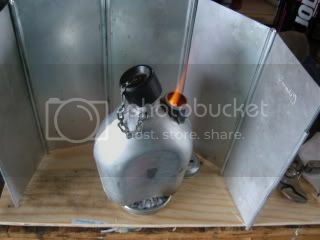 Then I made a sleave to run from the bottom of the tin to the top of the filler port opening and JB welded into place. This tin does NOT have to have the halves welded together. I've burnt it a dozen times without any failure or leakage. I seperated the tin and added wicking material(header wrap) . The last step that came about from testing was to create the drafting ring. Just a matter of cutting a circle just large enough to still fit inside the stove for storage and an ineer circle the is just large enough to fir over the stove neck. I then took some crimpers to the draft ring to allow better air flow. The stove and kettle will easily boil 2 cups of water in less than five minutes on just 1/2 ounce of denatured alcohol. The kettle will also work with the Heine Companion Plus stove when used in the wood burner mode. So there you have it, the " GI R2 KETTLE" and the "SRGT. YORK STOVE"
Sorry, with dial-up, movies are out of the question so here are a few pics of the system and even these take forever to load. Best I can do folks ! 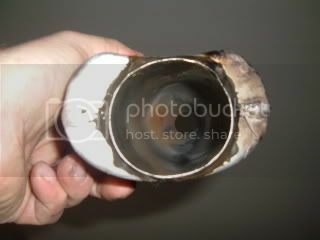 Should have pushed out that dent in the kettle while I had that big hole in the bottom. Might have been able to squeeze in another teaspoon or so. very cool. Love to hear how the seal in the kettle holds and how well it works with wood like the originally KK. I had problems today at photobucket. The bars down at the bottom were not lit up to click on for getting the clickable codes. I had to undo the single feature and click on "All" meaning all the photos on one album page would be highlighted and then the "bar" was illuminated to be able to click on it to get the codes. I only needed one code for one pcture so I had to highlight the one I wanted and then copy it so I could paste it here. You may try just linking to the photos for now to get them full size. At least enlarge 3, 4 and 8 beginning from the left. Loaded some larger images but still can't get the thumbnails to work. Hope the images give you a clearer view. Ridgerunner wrote: Loaded some larger images but still can't get the thumbnails to work. Hope the images give you a clearer view. It looks scientifically military. Gee whizz, that'll be a crowd stopper on the trails. Take your order book with you. You're pushing your luck if you put it on your wood burner. And just think, it comes with it's original pot cozy It does'nt get any better than this, does it? This is the best part!!!! The stove and kettle will easily boil 2 cups of water in less than five minutes on just 1/2 ounce of denatured alcohol. Thanks for the compliments, Zelph. 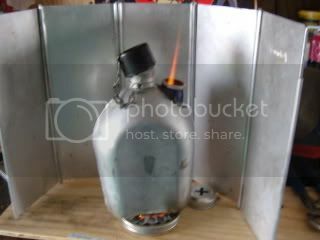 Are you saying that the fire/heat from the woodburner would be too hot for the integrety of the JB-Weld ? My creations are in the one or two of a-kind mold. I'm not into the retail aspect of it which is why I share all my ideas. Right now, my time is just too limited to mass produce stoves. It is just a hobby I like to tinker with. Just let it be known that the GI R2 (RR-RIDGERUNNER) Kettle was first introduced right here on BPLITE just in case you see it being marketed elsewhere. I thought it was a good concept that could be done on the cheap for the DIY hikers.